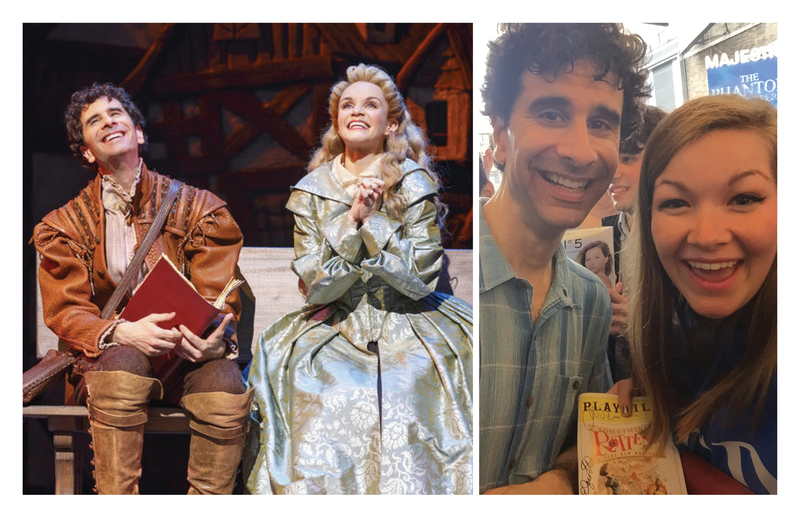 Above: Cariani and Kate Reinders in “Something Rotten!” on the right. Mariani and Schwarzkopf after the show on the left. Stock Photos. Imagine meeting the person who helped make your dream a career. What would you say? What would you do? On May 9, that dream became a reality for senior Andrea Schwarzkopf. On a trip to New York City with a few friends, Schwarzkopf and I decided to go see the new musical “Something Rotten!” Little did we know when we were going into the show, but playwright and actor John Cariani played one of the main characters. Cariani happens to be the playwright of “Almost, Maine,” a production that Lynn’s drama department put on in April of 2014. Schwarzkopf was one of the six actors to take part in the show. Freak out she did. Schwarzkopf was beyond excited when she realized who Cariani was. When she first saw his name, she asked me why his name sounded familiar and when I did not know, she flipped straight to his biography. “Almost, Maine” was the first full-length production that Schwarzkopf got involved with at Lynn. After traveling to Ireland with the production, Schwarzkopf got much more involved with the drama department. Schwarzkopf played the lead role of Margie in “Good People” this past fall and was one of the five girls in “Is There Life After High School?” this spring. In addition, Schwarzkopf also served as the president of the Drama Club for the last year and a half. After the end of the show, the actors come out to the stage door to meet fans and take pictures. This was an opportunity that Schwarzkopf was not going to miss. Cariani asked Schwarzkopf what school she went to, but she happened to be wearing a sweatshirt for American College Dublin – the school at which they performed at in Ireland. So she explained that she was from Lynn, but they performed in Ireland as well. Cariani was excited that his show had performed internationally. “Something Rotten!” has been nominated for 10 Tony Awards including Best Musical and is currently playing at the St. James Theatre.